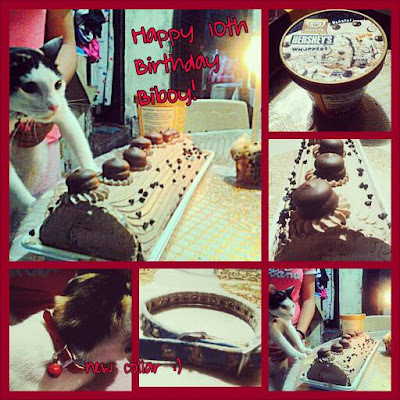 This blogpost is a tribute to my baby dear, biboy, who is celebrating her 10th birthday today. I decade of her life shared with us. 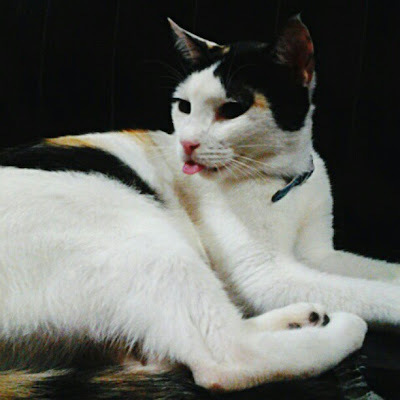 She had been with us since I was in first year high school. She is a second generation pet as her mother was my first pet kitty. She had been a witness to all my teenage angst, rebellious years and all heartaches since my first boyfriend. She had been my pillow in nights when all I want to do is breakdown and cry. I think she had seen me cry more than any other human being alive. lol. She knows when to make lambing in times when I am down. Cause most of the time she is this mataray type. Haha. We also had our share of love-hate relationship. Through all the scratch marks, bite marks and pagtatarays I received, I still love you dearly from the bottom of my heart. To my friend, my pet, my furry little sister, I hope we can still spend more time with each other. I know you are nearing your twilight years but I do hope we can still count years and years of being together. You will always have a special place in my heart that no other himan being can ever replace. You made it to 10 years old, is another 10 years with you too much to ask?